A gem known since ancient times, sunstone is a type of feldspar formed and crystallized in lava flows. Radiating with the power of eternal light, sunstone has been reportedly found in the tombs of Viking sailors who believed it would aid in their journey through both life and the afterlife. 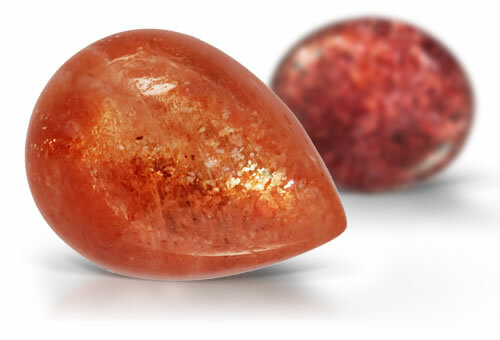 A distinguishing feature of sunstone is its metallic schiller, which rolls across the stone's surface. The effect is due to the presence of small plate-like inclusions of minerals such as hematite or native copper. These inclusions interfere with the passage of light, causing it to scatter. If the inclusions are larger and visible to the eye, they create glittery star-like reflections that gemologists refer to as aventurescence. Appearance, RI, birefringence, optic character and magnification. Adularescence in a stone indicates orthoclase. Sunstones contain tiny reddish to golden or green platelets of hematite or goethite. Stones might show a four-rayed star with slivery adularescence if fine needles intersect.